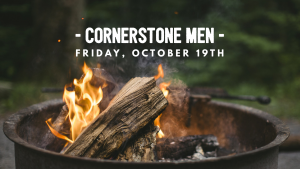 Come on out and enjoy some grub and time together with other men at the Andrews’ Ranch on Friday, October 19, 2018. Come anytime after 4:00 pm, and stay until dark. Please bring your favorite dessert to share. For address and directions see our Connect Table or email info@cornerstonecommunity.com.